The continuing debate on “What is an MSC”? Adherent bone marrow-derived cells that differentiate down various tissue lineages have traditionally been called Mesenchymal Stem Cells, or MSCs. There is great debate in academic circles whether this is an appropriate term, and alternative names such as Multipotent Stromal Cells, Marrow Stromal Cells, and even Multi-factor Secretory Cells have been proposed. While there is debate on the technical name, there is agreement that the “MSC” acronym be maintained. MSC differentiation potential. Taken from www.sci-therapies.info. In the 1950s, it was discovered that the adult bone marrow contained a rare, plastic-adherent stromal cell population, Mesenchymal Stromal Cells (MSCs)[1,2], that participate in maintaining the blood-forming, or hematopoietic, niche, and thus, they are implicated in organ homeostasis, wound healing, and aging. Ex vivo, MSCs grow as long, spindle-shaped cells with prominent nuclei and are capable of forming single-cell colonies on tissue culture plastic[4,5]. 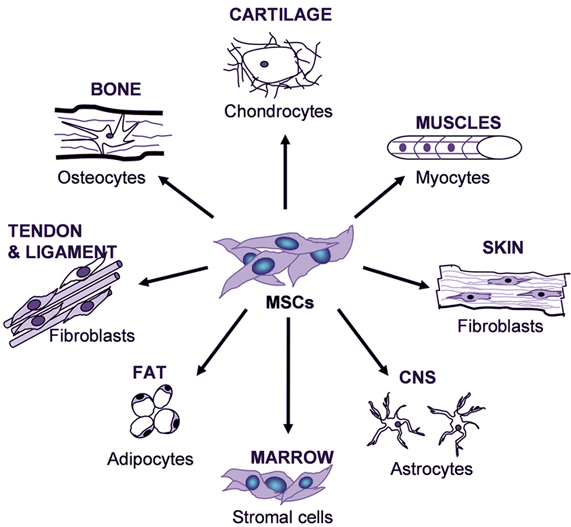 MSCs have the potential for self-renewal and are multipotent, i.e. they have the ability to differentiate to cells from a number of mesenchymal lineages including fat, bone, cartilage, and muscle both in vitro and in vivo[4-7]. Thus, these cells are also referred to as Mesenchymal Stem Cells and Mulitpotent Stem/Stromal Cells. Since their initial discovery in bone marrow, MSCs have been found to reside in many tissues in the body, including fat, umbilical cord blood, dental pulp, and peripheral blood, to name a few. Three major criteria have been established to define a cell as an MSC, including their plastic-adherence, their surface marker profile as measured by flow cytometry, and their ability to differentiate to osteoblasts (bone), adipocytes (fat), and chondrocytes (cartilage) under standard in vitro differentiation conditions. However, these historical criteria have not kept up with how these cells are used in application. Tri-lineage differentiation is relevant to less than 20% of all therapeutic applications. Furthermore, flow marker expression has recently been seen as having little relevance to function[9-11]. MSCs have been studied in a number of tissue regeneration and wound healing applications. Structural regeneration and functional improvements in damaged and diseased tissues upon therapeutic MSC application were initially attributed to cell engraftment and differentiation within target tissues. A more recent paradigm shift, however, has lead to widespread acceptance that positive outcomes following MSC (and most stem cell) transplantation are as much a function of the plethora of biomolecules secreted by these cells as a function of cell survival and differentiation[8,11]. In addition to the secretion of trophic factors, MSCs possess the ability to modulate the body’s immune response when transplanted alone or with another cell population, thereby providing for their off-the-shelf cell administration[13,14]. Given their immense therapeutic potential, relative ease of isolation, and the lack of ethical concerns surrounding use of these cells, it is no wonder that the bulk of increases in novel clinical trials since 2006 has been due to MSCs. There are currently over 400 novel global clinical trials investigating MSCs as therapies across a host of diseases[15,16]. Results of clinical trials have thus far been encouraging with both allogeneic and autologous MSCs demonstrating excellent safety profiles. Thus, MSCs will continue to be key components of future therapeutic agents, engineered tissues, and medical devices. We are interested in hearing thoughts on other themes that need to be considered related to MSCs, and if you agree or disagree with us. Please leave a note for us in the comments section below. Look for an upcoming post on current limitations to MSC use, including the need for standardization of the field. 1. National Institutes of Health Stem Cell Primer; 2009. 2. Friedenstein AJ, et al. Cell Tissue Kinet. 3:393– 403; 1970. 3. Friedenstein AJ, et al. Transplantation. 17:331-340; 1974. 4. Caplan AI. Prog Clin Biol Res. 217B: 307–318; 1986. 5. Pittenger MF, et al. Science. 284:143-147; 1999. 6. Caplan AI. J Orthop Res. 9:641– 650; 1991. 7. Wakitani S, et al. Muscle Nerve. 18:1417–1426; 1995. 8. Dominici M, et al. Cytotherapy. 8(4):315-317; 2006. 9. LoSurdo JL, et al. Cytotherapy, 15(12):1527-1540; 2013. 10. Carmen J, et al. Regen Med. 7(1):85-100; 2012. 11. von Bahr L, et al. Stem Cells. 30(7):1575-1578; 2012. 12. Gharibi B and Hughes FJ. Stem Cells Trans Med. 1:771-782; 2012. 13. Baraniak PR and McDevitt TC. Regen Med. 5(1):121–143; 2010. 14. Bernardo ME and Fibbe WE. Cell Stem Cell. 13(4):392-402; 2013. 17. Lalu MM, et al. PLoS One. 7(10):e47559; 2012.